If you have Crohn’s disease or ulcerative colitis, you may have difficulty maintaining healthy nutrition due to intestinal inflammation, disease-related complications, and use of certain medications. If you have inflammation in your small intestine, you may experience problems digesting food and absorbing nutrients. When the colon (large intestine) is inflamed, water and electrolytes cannot be absorbed properly. 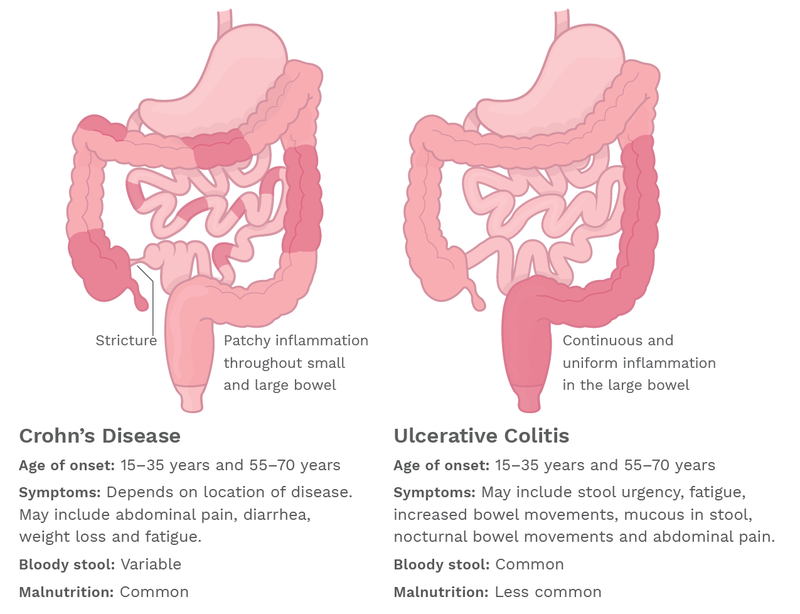 IBD may cause a variety of symptoms and complications, which, if not addressed, can lead to nutritional deficiencies and malnutrition. Severe diarrhea (excessively frequent or excessively liquid stools) can cause dehydration, which means your body may be depleted of fluids, nutrients, and/or electrolytes (especially sodium, potassium, magnesium, phosphorus, and zinc), and can also lead to weight loss. Abdominal pain and nausea can reduce your appetite, making it difficult to consume enough calories and obtain sufficient nutrients. Rectal bleeding, resulting from ulcers that form in the intestines, can lead to loss of iron and anemia. Frequent bowel movements may cause you to minimize eating to avoid diarrhea or trips to the restroom. Eating too little puts you at risk for becoming malnourished. Malabsorption (difficulty absorbing nutrients) may occur due to inflammation in the intestines. Proteins, fats, sugars, vitamins, and minerals are absorbed primarily in the small intestine. If you have Crohn’s disease that involves the small intestine, inflammation can interfere with absorption of many nutrients, leading to malnutrition and weight loss. This can be more serious if larger sections of the small intestine are inflamed or removed by surgery. Growth delays may occur in some children with IBD as a result of long-term use of corticosteroid medications (such as prednisone), intestinal inflammation, and malnutrition. Decreased bone strength is common in children and adults with IBD due to poor absorption of calcium, vitamin D deficiency, decreased physical activity, inflammation, and/or long-term use of medications such as corticosteroids, and can increase risk for bone fractures. Strictures occur when repeated inflammation causes the formation of scar tissue and narrowing of the intestine. This can make it difficult for digested food to pass through the stricture easily. High fiber foods, such as fresh fruits and vegetables, may become blocked or stuck in this area, causing pain, bloating, or nausea. Low fiber or liquid diets may be needed to reduce symptoms if the stricture is very narrow. Medication is often needed to reduce inflammation. Medications tend to work better in people with good nutritional status. However, certain IBD medications can interfere with optimal nutrition. Corticosteroids may cause weight gain and increase your risk for diabetes. At the same time, long-term use can also cause a decrease in healthy muscle mass, as well as bone and skin strength. Sulfasalazine and methotrexate may interfere with the absorption of folic acid, a vitamin that helps the body make new healthy cells. If not identified and treated, dehydration and malabsorption of nutrients can put you at risk for becoming malnourished. Poor eating habits, weight loss, and vitamin and mineral deficiencies, as well as general fatigue and weakness are all possible signs of malnutrition. It’s a good idea to be checked for vitamin and mineral deficiencies, even if you do not have these symptoms. Malnutrition can range from mild to severe. Even milder cases can lead to symptoms like low energy and loss of muscle mass, which can, in turn, make recovering from illnesses take longer. It is important to talk to your healthcare team about getting tested for vitamin and mineral deficiencies. Eat a diet that is well-balanced and avoid foods that worsen your symptoms. If your diet is limited due to your IBD symptoms, it may be helpful to work with your healthcare team to identify a list of foods that will enable you to keep up a well-balanced, nutritious diet.